Jacko.MY just passed its 1st year anniversary. Don't ask me the exact day, I don't remember until I received a reminder from the domain registrar on renewal. From the reminder, Jacko.MY should celebrate its 1 year old birthday on 19 July 2009. Opps, it's been 2 months ago. Ya, that's how busy I am these days, typical workaholic when the enthusiasm on work is on its peak. I have been neglectful about my surrounding, my bad if you feel that, including Jacko.MY. I got a new idea to try on a cooler domain name. Ok, not really an owner, but a domain parker who registered the domain to make quick money when somebody offers to buy the domain. Profitable business? Of course. 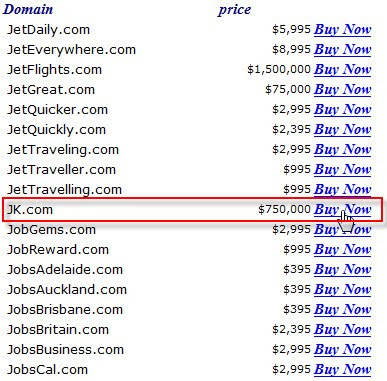 I remember ages ago there were cases where somebody registered the domain of a well known brand i.e. nike.com and the company needed to pay millions to buy back from that smartie. How much is a domain? Typically it's from USD$9.99 or even USD$0.99 per annum sometimes. Good money huh? If you think ahbeng.com or ahlian.com or any name which is going to be a global brand, go register one to become millionaire the quickest way. Anyway, no change to Jacko.MY and I am pretty confident it's gonna stay forever until I die, or until I am broke to pay for renewal.